Hope you all enjoyed the Benda A Minor Sonatina Play-Along. Even if you weren’t able to stay on schedule while it was happening, the beauty of a Play-Along is that you can jump in anytime even after the scheduled Play-Along has ended. 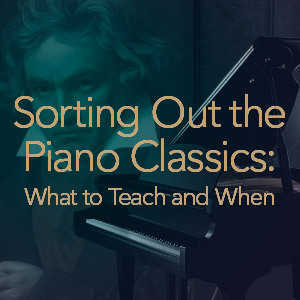 Make any Piano Play-Along our own self-guided project to learn a new piece and gain a little more insight about it. But remember Play-Alongs are community projects also. I want to hear your thoughts about the pieces whenever you “play-along”. So….. practice a little, read a blog post along the way for insight, maybe make a comment on your findings, practice a little again, read another blog post, comment, etc. A little info about Benda to share with students….. 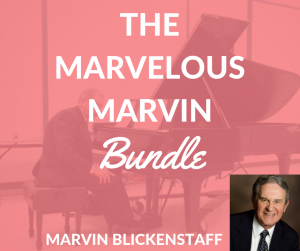 This is a deservedly-popular and beloved piece for student pianists because of its engaging musical characteristics. It offers tuneful melodies, dramatic harmonies, and finger-tickling toccata-style goodness with every measure. The fact that it’s short, yet full of interesting twists and turns makes it appealing to students and its show-stopper quality is appealing to audiences as well. Makes you wish there was more of it once it’s over. Excellent study in rhythm and part-writing for an aspiring intermediate pianist and offers opportunity to explore a good range of the keyboard. The student will have to count like a fiend and absorb many details in articulation, but the pay-off is worth it. I find that students continue to play this piece on their own even long after they’ve completed it. That’s a good sign of a mesmerizing piece….. 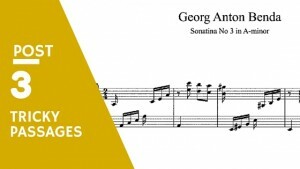 Studying the Supraphon edition at imslp.org was quite revealing. It was surprising to see how over-edited this piece has become through the years and how inaccuracies have prevailed in student editions. I think a NEW student edition is in order, one that reflects Benda’s first edition more accurately with added notes to students about pedaling, accurate distribution of the voices, repeats, etc. 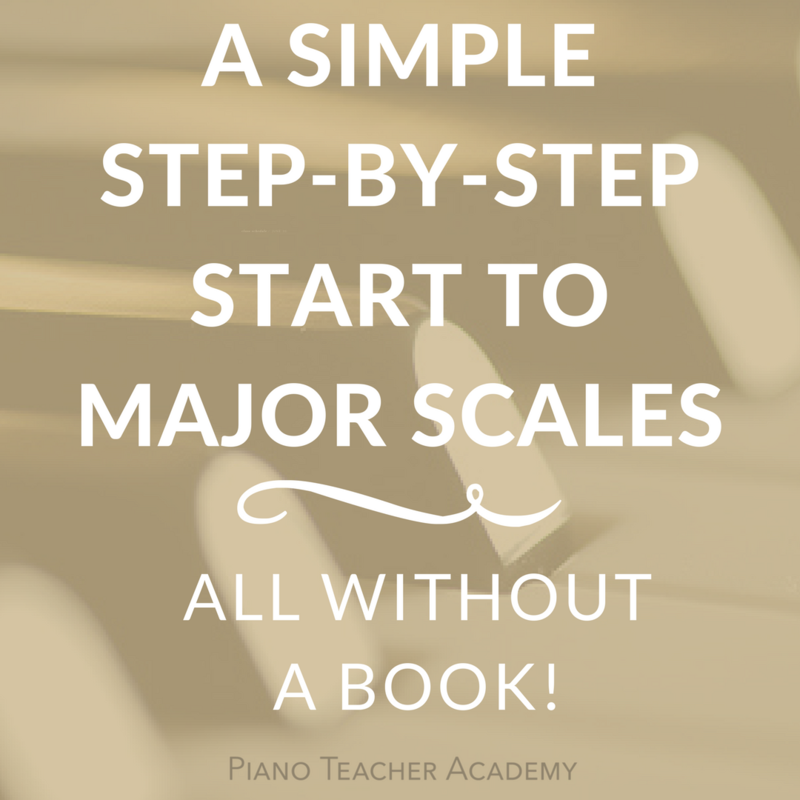 I’m going to prepare a new student-friendly edition for the Piano Passport catalog, and include a short learning guide for mastery of the more difficult technical areas. How does that sound? More teachers and students should have quick access to this wonderful piece! Please pipe in with your take-aways below…. would love to hear your thoughts. I hope you all have enjoyed the Benda A Minor Sonatina Play-Along with the Periscope enhancements this time. I’ll continue to “scope”-along with our Play-Alongs. 🙂 I think it brings our score study to life and I enjoy how it builds even more community among participants in our group. Please comment below with your thoughts on the addition of Periscope, and tell me if there are other aspects I could highlight during a scope session. I’ll try to add more future student performances as I am able. And….I’m working on a plan to SAVE some of the Play-Along Periscopes for later viewing after the 24-hour expiration. Bear with me! Don’t forget to watch the mini-video tutes on Instagram. 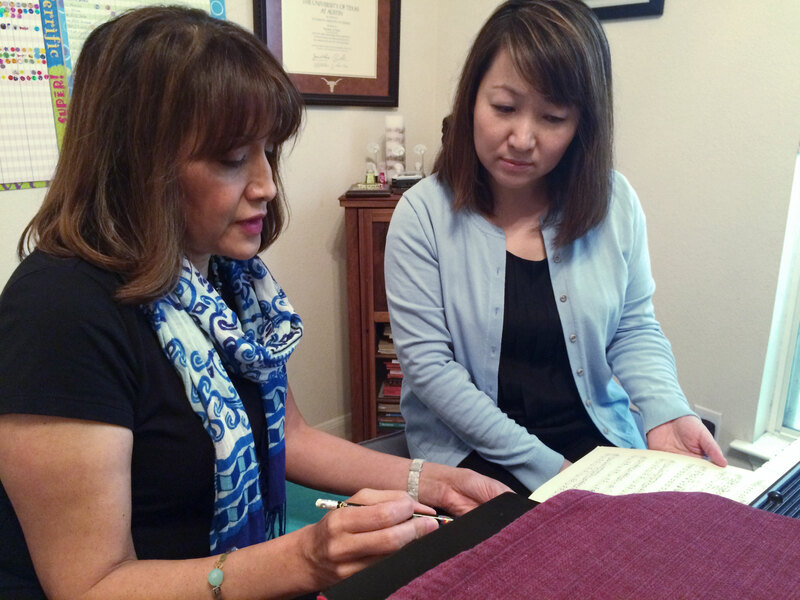 FOLLOW @pianoprof at Instagram and Periscope and set your notifications to ON. 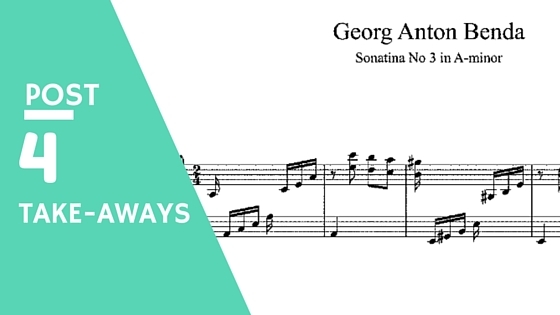 Now that you’ve been playing the Sonatina for approximately 2 weeks, what do you think is the trickiest passage(s) in the piece? Either for you or a potential student? Please ADD YOUR COMMENT BELOW with measure nos. Of course, there could be several “tricky” spots for students when they first begin working on this piece and I remarked on those in an earlier Periscope. For this post, I limiting it to the TWO spots that I think cause the most concern for the teacher and student. This sudden change in texture really blindsides students at first. At m. 41 they lose all rhythmic precision and suddenly slow the tempo way down. 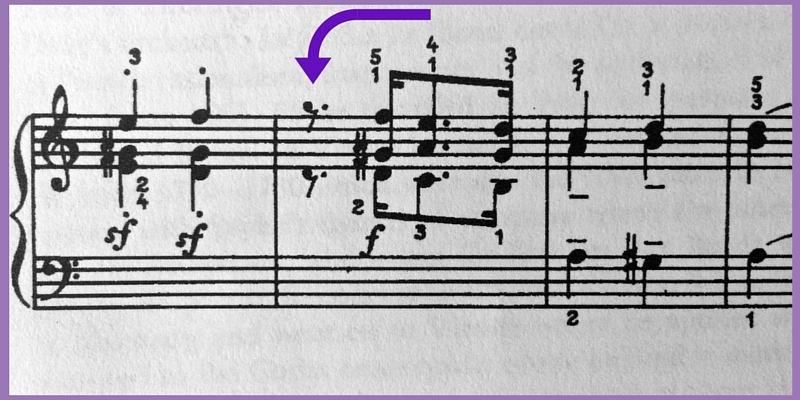 I believe the root cause is the rhythmic shift from 16th-note subdivisions (mm.39-40) into eighths, then quarters later, and then dotted eighth-sixteenths, etc. I find that students try to approximate the pacing of the eighths in m. 41 rather than count it precisely. As mentioned in my Periscope, students must count like fiends in this area. There’s just no way around it. I have students count aloud from mm. 39 forward, by just saying the rhythms aloud first without playing. 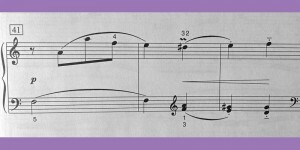 While pointing to the rhythms in the score, I have them count 16ths in mm. 39-40, followed by eighths in mm. 41-43, and so forth. My students recite “1-ee-and-a” for 16ths and “ 1 and “ for the eighths (you could choose another counting method if you prefer). Once they get their lips wrapped around the counting, they truly know it and can direct their fingers to follow what they recite aloud. While counting they can also listen for the steadiness of their tempo. Of course, have them work hands apart as needed. This is the first and only pause in the entire piece. Did you notice that? And it seems that students park themselves on this rest while they scurry to arrange their fingers quickly for the dotted rhythms. 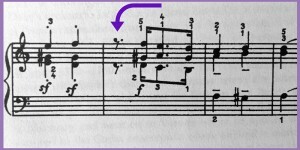 Again, working hands separately and counting 16th subdivisions very precisely will assist in the entrance, but it’s the quick consecutive double-note manuevers in the RH that cause concern here. 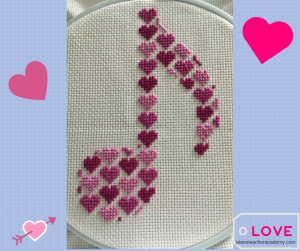 NOTE: Two notes for the RH and single notes for the LH. is exactly how Benda wrote it in his first edition according to the Supraphon editors. For more info about this Czech edition, click HERE. 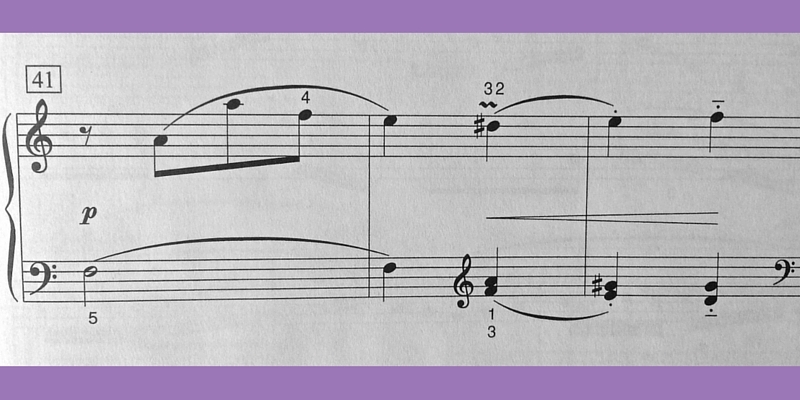 PLAYING TIP: Rather than play directly downward into the keys on the RH double notes, stay close to the keys and use a “sliding” motion with the hand as you play each pair of double notes. The video below demonstrates. When you time the sliding motions with your counting it all comes together so much more easily and there’s no fumbling around with the hand jumping about. Do you hear the student counting? He makes it look easy, doesn’t he? But…..he’s always determined to solve issues by counting. I hope this helps. I look forward to your REPLIES below. Please share so we all may compare notes, OK? A little Benda “wrap-up” post will soon follow this one. Keep on practicing!